When the decision is made to bring a TV show to the big screen, it's obvious that money is the motivating factor. Beyond that, the powers that be are faced with a decision of which direction to go. Do they want to make something which follows the formula of the show or branch off in a new direction? Will they embrace what made the show popular or risk alienating the fan base? When J.J. Abrams took over the Star Trek franchise, he produced two big, loud, bombastic movies which played like updated versions of the Star Trek theatrical films. (There's no doubt that Star Trek Into Darkness was simply a remake of Star Trek II: The Wrath of Khan.) Will Star Trek Beyond continue this trend or harken back to the original television series? Star Trek Beyond opens some time after the events of Star Trek Into Darkness. The Starship Enterprise is continuing its five-year mission to explore new worlds, but Captain Kirk (Chris Pine) is getting bored of it all, and it considering taking a post at the Yorktown, a massive space station. As the Enterprise docks at Yorktown, Mr. Spock (Zachary Quinto), gets some bad news, while the rest of the crew attempts to enjoy some "R&R". Meanwhile, Kalara (Lydia Wilson), comes to the space station, reporting that her ship was ambushed near a strange planet. Sensing an adventure, Captain Kirk gathers the crew and they navigate a mysterious nebula and approach the mysterious planet. Suddenly, they are ambushed by hundreds of small spaceships which attack the Enterprise and radically change the mission. The crew find themselves scattered across the planet, some on their own, some captured by an alien named Krall (Idris Elba). Scottie (Simon Pegg) meets Jaylah (Sofia Boutella), an alien who is also marooned on the planet. She helps Scottie and Kirk formulate a plan to rescue everyone. Star Trek Beyond was written by Simon Pegg and Doug Jung, which may help to explain why Scottie has so much screen-time and he (sort of) gets the girl. But, Pegg's involvement can also shed some light on the film's direction. As an acknowledged fan of the genre, it's not a leap to assume that he wanted to take the movie back to its roots. So unlike the first two films in this most recent series, Star Trek Beyond plays more like a big-budget episode from the original TV show. The Enterprise goes to investigate a new planet, the crew gets capture, they meet a friendly alien, and Kirk must come up with a plan to save the day. Wasn't that the bulk of the episodes in the original series? The movie follows this formula to a T and every character gets to play their part. There are also some nice moments with Spock and Dr. McCoy (Karl Urban). As Abram was off directing some kind of Star Wars movie or something, the directing reins were handed to Justin Lin, best known for helming several films in The Fast & The Furious franchise. He does a fine job with the action scenes here but, unlike most other Star Trek projects, there isn't much of a focus on emotion. This encapsulates the entire movie. As stated, it plays as a great homage to the classic stories of the original series, but, in the end, it simply feels like a long episode, and doesn't carry the weight of a major motion picture. Also, this is one of those movies that seems fine while watching it, but when you go back and think about it, you realize that there are some plotholes. The film failed to make back its budget at the U.S. box office, and I'm sure that this has thrown the idea of subsequent entries into question. I like the cast and the vibe of this films series, so I'd be game for another one, but let's get back to doing event films. 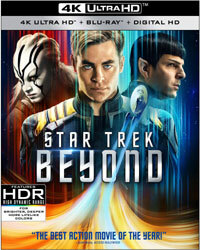 Star Trek Beyond actually made good on a song from the trailer on Blu-ray Disc courtesy of Paramount Home Entertainment. The film has been letterboxed at 2.35:1 and the Disc contains an AVC 1080p HD transfer which runs at an average of 30 Mbps. The image is very sharp and clear, showing no notable grain and no defects from the source materials. The colors look very good and the image is never overly dark or bright. The level of detail is excellent and the image contains a nice amount of depth, even in this 2D version. The Disc carries a Dolby Atoms 7.1 audio track which runs at 48 kHz and an average of 5.5 Mbps. The track provides clear dialogue and sound effects. This is an impressive track, as it offers distinct audio effects from the rear channels, and detailed stereo effects. The action scenes bristle with good sound, which moves well from front to back and side to side. The subwoofer also gets in on the action. This set also includes a 4K Ultra HD Disc where the film has been letterboxed at 2.35:1 and the Disc features a 2160p HD transfer. The image is super sharp and clear, showing no grain and little distortion, even when standing right in front of the screen. The colors look great and daytime scenes are incredibly crisp. The actors are truly separate from the backgrounds here. The Disc carries the same audio track as the Blu-ray Disc. The Star Trek Beyond Blu-ray Disc contains many extra features. We start with two DELETED SCENES which run about 1 minute. "Beyond the Darkness" (10 minutes) examines the planning of the film and how some new blood was brought in behind the camera. "Enterprise Takedown" (5 minutes) looks at how the drama unfolds very quickly in the film and how the crew is immediately put into peril. Similarly, "Divided and Conquered" (8 minutes) reveals how the characters were intentionally separated and paired in the story. "A Warped Sense of Revenge" (5 minutes) introduces us to Krall, the new villain in this film and actor Idris Elba. We see how certain scenes were shot in Dubai in "Trekking in the Desert" (3 minutes). "Exploring Strange New Worlds" (6 minutes) takes us on-set to see how the alien sets and landscapes were designed and created. 'New Life, New Civilizations" (8 minutes) proves that some people do still work in latex, as we get a peak at how the various aliens were created. "To Live Long and Prosper" (8 minutes) reminds us that 2016 marks the 50th anniversary of Star Trek, with clips from the various shows and films, as well as comments from those involved in the movie. "For Leonard and Anton" (5 minutes) is a tribute to the late Leonard Nimoy and Anton Yeltsin. The final extra is a 5-minute GAG REEL.